ON 25 NOVEMBER, 1970, Henry Scott-Stokes, then Japan bureau chief for the Times, was in a taxi heading towards the Tokyo army garrison where his friend, the author Yukio Mishima, had been attempting to rouse Japanese soldiers into a coup d’etat. He wouldn’t make it on time. Mishima, who earlier that day had completed his long novel The Sea of Fertility, had reached the end of his intense and convoluted life. After appearing on the garrison’s balcony in military tunic where he was mocked by soldiers, he retreated inside and committed seppuku, a ritual suicide involving a sword cut into his own belly – effectively disemboweling himself – before being beheaded. There is a clear physical resemblance between Scott-Stokes, now 66, and the actor heavily tipped to portray his part in The Mishima Incident – Jude Law. Devlin, a 38-year-old publisher who swapped Glasgow for Tokyo 15 years ago, says that while he expected a high level of interest thanks to the recent successes of The Last Samurai Lost in Translation and the soon-to-be-released Memoirs of a Geisha, Mishima’s story is very different. Few have been in a better position to determine Mishima’s motives and beliefs than Scott-Stokes, who had even been on holiday with the writer, his wife and two children. “I had a tremendous impact on his life,” Scott-Stokes says. “One day when he came to the Times office in Tokyo he declared after reading my piece that I was the first person to take him seriously, as a soldier. I certainly wasn’t alone, but I did help shape the last years of his life. It is clear that Scott-Stokes, in the year that also marks what would have been Mishima’s 80th birthday, also holds himself partly responsible for his friend’s death. “What was so exciting about him was that he was a man who came in all kinds of different forms; a playwright, essayist, author of short stories, he was deeply involved in the movies and yet still found time to be a proficient sportsman and a political activitst,” says Scott-Stokes. A fragile child, Mishima had been declared unfit for military service during World War II, but captivated the public in the aftermath of Japan’s defeat with his prose. His reputation was unique in Japan – so high that as a young man he even courted Michiko Shoda, who would later marry the present Japanese emperor. His works had been received to wide acclaim and he had even been suggested as a future Nobel prize winner, but Scott-Stokes says there was also a dark side to his character. He led a sexual double life, balancing his marriage with homosexuality, and was fascinated by violence – particularly the act of seppuku. He was also a firm believer that Japan should again be militarily strong at a time when, with World War II still a recent memory, that opinion was unpopular. Mishima set up a private army, the Tatenokai, who wore brown quasi-military uniforms and conducted military exercises in a camp at the base of Mount Fuji. His politicial sup porters included Yasuhiro Nakasone, who was later to become prime minister and still wields considerable power in conservative political circles, while he was also close, for a time, with fellow author Shintaro Ishihara, who has since gone on to be elected mayor of Tokyo and still makes no apologies for his outspoken Japanese nationalism. 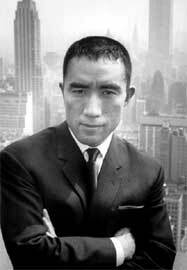 Frustrated at failing to rouse society to a new self-belief, Mishima attempted to short-circuit the process and stage his own coup. Taking the base commandant hostage on November 25, 1970, he appeared on the balcony and was captured in perhaps the most famous image of his life. In his military tunic, white gloves and a bandana tied around his head, he appeals to the soldiers – who respond with catcalls. He returned inside the building, knelt down, shouted three “banzais” for the emperor and thrust his sword into his stomach. A nervy second soldier tried three times to behead Mishima before another acolyte, Hiroyasu Koga, stepped forward and completed the task. “Yukio was a man of many parts; to some he was a genius but to those on the Left he was a nutcase – but I liked him,” says Scott-Stokes, whose biography, The Life and Death of Yukio Mishima, is considered the defining work on his career. “He cut short his life on the day that he completed his last long novel, The Sea of Fertility, and he timed it that way, with a dramatist’s flourish,” he said. “And he gave warning to his friends in various ways. To me, he wrote letters in English that hinted at suicide. It is to my eternal regret that I did nothing. “Was it a cry for love? Yes, I think it was. Was it a cry for help? Most certainly. Was it, most importantly, a cry for a nation? Absolutely. It has taken Japan 35 years to “digest” Mishima’s shocking death, according to Scott-Stokes, but the film project and the largest museum exhibition of the author’s memorabilia is an indication that the country as a whole is at last coming to grips with a man who still fascinates many. That fear might increase when – rather than “if” – the film project goes ahead due to a recent upswing in bad feeling between Japan and its neighbours, particularly China and South Korea. Both Beijing and Seoul are very sensitive about any suggestion that Japan might again be a military power in the Far East, but Scott-Stokes says the tale is about the man and the way he lived and died.